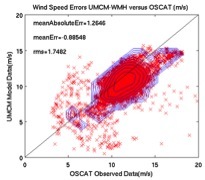 During the summer months of 2014, I worked under Dr. Shuyi Chen to compare data from OSCAT and TRMM satellites with the UMCM-WMH model for 10-meter wind speed and rainfall forecasts within the Gulf of Mexico. Comparisons of model forecasts and observed satellite data were studied for November and December of 2013 when the SCOPE project took place, as well as July and August of 2012 when the earlier GLAD project was conducted. 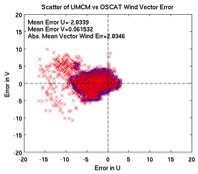 These comparisons involved several different methods of analyzing the accuracy of UMCM forecasts, including wind speed difference maps, wind vector difference maps, and scatter plots quantifying model error or bias. Through analyzing differences in model forecasts and observed data, we can better understand the physical processes behind wind, rain, and ocean surface currents. These processes are very involved and interconnected. Over the course of studying the model forecasts, I found that the model was quite accurate in predicting magnitude of wind speeds. However, the location of mesoscale systems, pressure systems, tropical storms, and other physical features was slightly altered, thus creating a chain effect leading to inaccurate wind speeds and directions directly around the geographical location of the physical features. I found forecasts to be more accurate on days when the “Bermuda High” was behaving as it usually does. In other words, when the Bermuda High was normal. Further research is needed. 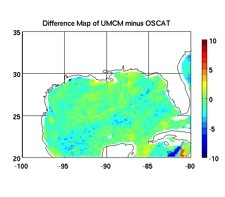 Analyzing the accuracy of the UMCM model within the Gulf of Mexico allows our research team to identify biases within the model and hopefully find ways to eliminate them so that more accurate forecasts can be made. These model improvements will help researchers, such as those on GLAD and SCOPE, determine the best positioning for their instruments (i.e. drifters) and furthermore help anticipate where these instruments will go, thus allowing for easier retrieval and data collecting. 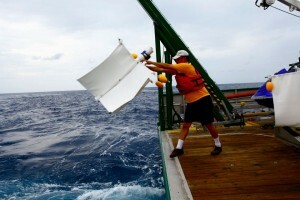 Moreover, working to understand this data allows for better comprehension of how ocean surface currents move, which is a vital process to the CARTHE group. When contaminates such as oil are introduced into the surface of the ocean, they will move along with the surface currents. Determining where such pollutants could end up is necessary for the well being of marine and land ecosystems. I am very grateful to have had this research opportunity with CARTHE and to work in a professional environment with such talented scientists, especially Dr. Chen. I have learned so much valuable information about how the atmosphere and ocean are so interconnected and work in such intricate harmony. I am also thankful that this research could help contribute to better understanding how pollutants are transported in the ocean and atmosphere, and furthermore how we can help deal with disasters such as oil spills.